This collection of Christmas gifts kids can make makes holiday gift giving easy! 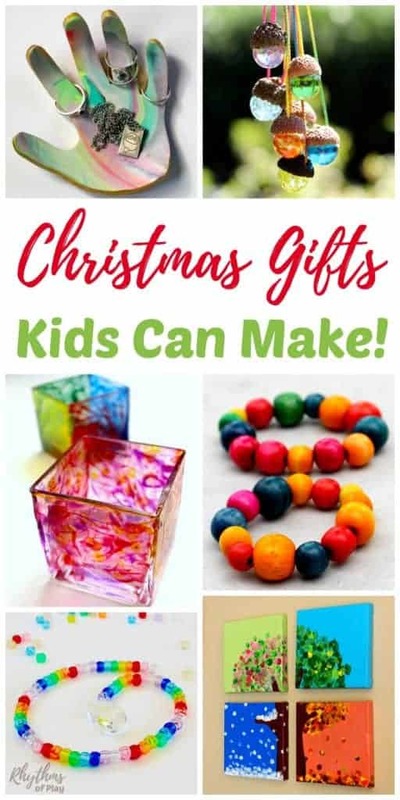 Homemade crafts like these kid-made gift ideas are always a favorite with friends and family. Making Christmas gifts is a fun way to connect with the kids during the holidays. Click on the image or text of each DIY project to open the easy to follow directions for each unique handmade gift idea. Friends and family love receiving handmade Christmas cards from the kids! Keepsake gifts are always a hit for the holidays. Moms, dads, aunts, uncles and the grandparents love handprint crafts and other keepsakes made by the kids. Moms, grandmas, and aunts love to wear and show off handmade jewelry. Even dad and grandpa will enjoy recieving a cool necklace or bracelet from the kids. My husband loves his acorn marble necklace made with a large shooter marble and a big acorn cap. Sunacatchers are an easy way to add a sparkle of color, a touch of class, and sprinkle of rainbows around your home. We like to hang them in our windows to improve the view and use them as pull chains on lamps and ceiling fans throughout our home. Hand painted candle holders filled with candles and homemade treats make an excellent gift idea from the kids! Make something that your family will love with the kids for the holidays this year. 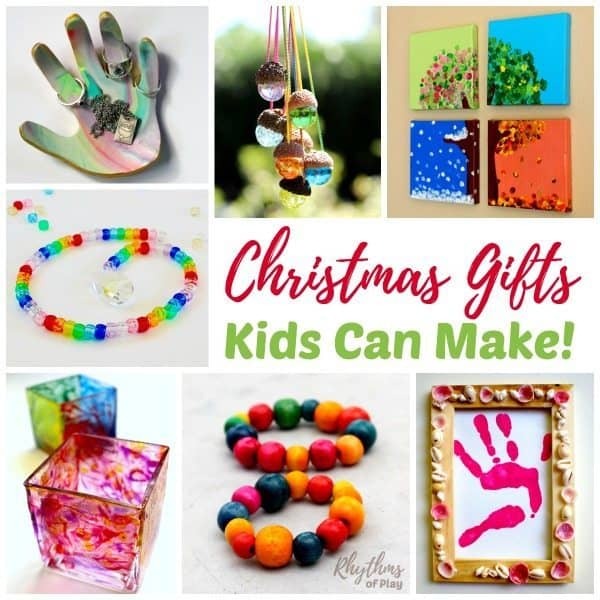 Handmade crafts like these DIY kid-made gift ideas for Christmas are always a hit! You may also like this awesome collection of Christmas Ornaments Kids Can Make and Meaningful Christmas Traditions for a Magical Holiday! I found so many cool ideas! I love making homemade Christmas gifts, thank you! !